Welcome to the Colour Me Positive 2017 art journal challenge. It’s simple really. On Friday of each week I will post the new weeks challenge on the blog here. If you are signed up to the Lulu Art mailing list, you will also receive an email to let you know it’s live. A link to the current weeks blog post will also be pinned to the top of our Facebook page each week so you can find it quickly. My post will include a positive quote for the week for inspiration. It will also include an extra/optional challenge prompt. Time permitting, myself or a Design Team member will put up an examples of pages we have done with the quote as inspiration, some of which will also incorporate the extra challenge. These pages are purely to show you what we have done and how we have interpreted the challenge in our own journals. What you create is entirely up to you. You can take a word from the quote, a feeling, a colour, the extra prompt, all of the above or nothing at all. I repeat, it is entirely up to you what format it takes, what mediums you use and what direction you go in. I can’t wait to see what you do with it! I recommend using an art journal, either hand made or bought, so that all your CMP work is in the one place and doesn’t risk getting lost, however the choice is ultimately yours. Lulu Art Store stock a huge range of art journals or you can learn to make various journals in my online course, Journal Playground. Whatever you decided to do is fine. Don’t forget to share photos! I won’t be offended if you don’t use the challenge prompt at all and totally do your own thing. We’ll just be excited that maybe we inspired you to take action in your journal. That is our aim, to keep you inspired and moving with your creativity, and hopefully to keep you positive with the words/quote I share. Please don’t feel overwhelmed or intimidated if you see someone post a photo of their amazing artwork. Just remember, you are amazing too, we are all just at different levels of our own journey. Don’t let it ever stop you posting. You just don’t know who you might inspire in the process. The challenge is really flexible. You can pop in and out whenever you like. There is no commitment. We only ask that you be kind to one another in the Facebook group, support each other and most of all – relax and have some fun!!! A note about sharing photos on our Facebook page – I will set up an album for each weeks challenge. Please add your photo to the relevant weeks album. It will be so much easier to keep them all organised and for when we are doing weekly prize draws (you’ll read about those further down the page!). Make sure you title your work with the appropriate week so members viewing your work know exactly which prompt/week your work is based on. Only images that go into the album will be eligible to enter the giveaway, as it is too time consuming for me to go through everyone’s upload and place it in the album myself. Let us know if you’re not sure how to share to an album and we’ll give you a hand. Also please remember to upload from your files rather than sharing from another FB page. Sharing from another FB page doesn’t always work properly so remember to upload direct from your files instead. My best advice is to just start where you are, with what you have. You really don’t need every supply out there (of course we want them haha but we don’t need them). Don’t despair if you only have a few things or you have a limited budget. If you only have a few pencils, do your challenge with those. If you have a few old acrylic paints, break them out and use those. You might be a scrapbooker, so break out your pretty paper scraps to make some collage backgrounds. You don’t have to use the same products we use, get inventive and use up your stash. You’d be amazed at the beautiful work you can create with limited supplies, even just a ball point pen. For those of you who are new to art journaling and are wondering where to start, here is a list of supplies that would be good choices for a basic art journaling kit. Lulu Art Store will have journaling kits available soon. A good sturdy journal – if you intend to use any paints or sprays then you want a journal that can take the pressure! I recommend any of the Strathmore mixed media journals, the Dylusions journals or even working on seperate sheets of watercolour paper and binding it together at the end of the year. There are lots of options. I always have several journals on the go, at the same time, but will try my hardest to dedicate a journal just for CMP entries. Some cheap acrylic paints – these are great for creating backgrounds for your journal pages. My favourite is Ceramcoat. These acrylics are highly pigmented. Some cheap brands of paint are low pigmented and very translucent,which means you end up using more paint to create a nice opaque area. Stencils and Stamps – Are easy to use and can create an instant arty effects without having to have any drawing/painting skills. Old magazines – great for chopping out pictures and words to collage on to your pages. Journaling pens – I personally love the Sharpie Paint pens as they will write over most surfaces. Anything waterproof is best. You may have noticed we are an Australian online Art store. So if any of our Australian ladies are looking for anything in particular we are most happy to help. When the store re-opens there will be different Art Journaling Packs to get you started. If there is ever anything you would like to see me stock, please don’t hesitate to let me know. I love to hear about new products and experiment in my art journal. The Lulu Art Design team is about to be chosen . The team will alternate in showing you new techniques, playing with ‘must have scrummy’ products from our store and inspiring you to create your own fabulous artwork. I also have a line up of artists who I will be interviewing throughout the year. Some of them are offering fantastic prizes for our weekly prize draw. Look out for that as they are brilliant prizes. As mentioned above, this year I’ve have had some wonderful donations from several of our feature artists and we also have a few goodies up our sleeve as well. Every week there will be a giveaway. A name will be drawn randomly from those lovely people who participate by loading up a photo in that weeks album on Facebook. This is not a game of skill. We know that you are all at different levels in your art. The draw will be totally random using a random number generator and counting from the first photo loaded. We know sometimes life happens and we don’t always get a chance to work in our journals every week. Therefore we will draw the winner of the prize draw two weeks after each blog post .. so for example, Week 1 blog post goes up on 6th January, you have two weeks to get a journal page completed and loaded up in the Week 1 folder, a name will be drawn on Friday 20th January. I will be posting a list of daily journal prompts each month, for those of you who journal daily and want more of a challenge. Throughout the year I am hoping to organise a few ‘Art swaps’, but will notify you well in advance for these. Feel free to share photos of your work. Any photos shared on the Facebook group remain private and only seen by those who are members as it is a closed group. Please respect the privacy of your fellow members by not sharing any of their photos on social media (e.g. Pinterest, facebook, instagram, twitter, etc). If we share elsewhere then it will only be with the permission of those involved. If you choose to share your own photos of your own work then you are most welcome to share them wherever you like. Please use #colourmepositive whenever you share your work, so that members can easily find and follow you on your social media sites. This is also a great way to promote the challenge and inspire others. I will be posting here on the blog at approximately 9am on a Friday mornings here in Victoria, Australia. This is approximately 2pm Thursday in Los Angeles, U.S. and 10pm Thursday in London, U.K. I look forward to getting to know you throughout the year. Here’s to a fun-filled creative 2017. If you haven’t already signed up to get the weekly emails you can sign up here for a year of positive creativity. If you haven’t joined the facebook group you can do so here. We’ve had this idea brewing where we wanted to do something really positive with the business that would help others in some way. This month we have decided to introduce a regular monthly challenge which you all can participate in for the chance of a prize but also to do some good out there. After reading about the Truth Card exchange put together by the Brave Girls Club we have been inspired to set up this inspiration card challenge that will result in helping others in a similar way. A simple card or tag with a quote which might just brighten someones day or potentially make a huge difference to someone who is doing it tough. 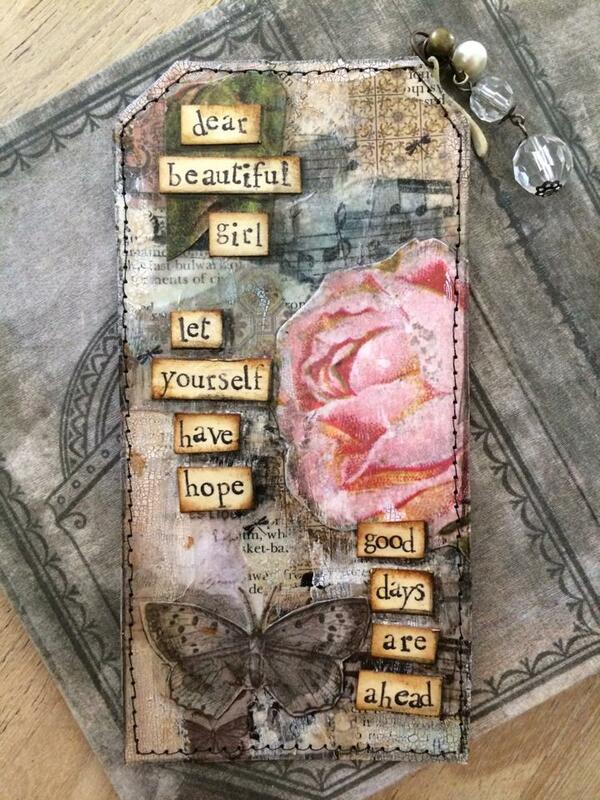 So here’s the deal – Decorate a small piece of card (example ATC size 2.5in x 3.5in – or similar) or even a tag including a positive uplifting message. Photograph the item and email the picture to admin@luluart.com.au with “April Challenge” in the subject line or post it on our Lulu Art & Friends facebook page (a page we’ve set up where we can share interesting things we come across and you can all share photos of your art and mingle with each other). After you’ve photographed the card we want you to give this card away — yes, give it away! – You can either give it directly to someone you know who needs a pick-me-up, you can leave it somewhere for a stranger to find, or alternatively you can send it to me (Lulu Art, PO Box 1769, Noosa Heads, Qld 4567) and I will pass it on to a dear friend (one of our design team mebers, Monika) who puts together cosmetic bags for women who have had to flee to shelters after domestic violence. Imagine how much of a difference it could make to one of these women to see a beautiful positive message. Each month we will showcase some of the entries and choose a winner which will be published on our blog and the facebook page. Below is an example of one of these inspirational cards (or in this case a tag) made by one of our design team, Karen Knight. Thanks Karen for sharing this pic with us. I’d love for you to join us in this challenge and help make a difference out there. Our monthly winner will receive a store voucher to the value of $25. Entries close on Friday 25th April and the winner will be announced on Monday 28th April. Even if you don’t want to enter the challenge I would encourage you to do something like this to make a difference in someone else’s life. We often have no idea what people around us are facing and receiving a gift like this could really brighten someones day. You never know what a simple gesture like that could mean to another person.